ALL ORDERS within Continential U.S. This is an aftermarket backup camera, not OEM. This camera will plug into your existing wire harness. If your vehicle currently does NOT have a backup camera system, this camera will not work. Double Check your part number prior to ordering. View three different camera views on the bright 4" IPS screen. The entire DVR unit is only 4.25" long, 3" high, and 2" wide enabling the unit to fit under most rear view mirrors. You won't miss a thing with our 3 camera DVR unit. Featuring a front facing camera with a 140°, a cabin facing camera with 100° camera, and a 85° backup camera. Installation is easy, simply attach the DVR to the included windshield suction cup mount then attach to your windshield. The DVR is powered by a regular cigarette lighter power cord. No one wants a car accident, but if it does happen our DVR will have your back. A g-sensor will automatically record the video giving you valuable evidence. Loop Recording: Off/1 Min/2 Min/ 3 Min. At Master Tailgaters, we focus on providing superior quality aftermarket parts for your vehicle. This Model is our Highest End Mirror, the Best of the Best. The OEM replacement aftermarket Ultra Bright 4.3" LCD Rear View Mirror fully replaces your current rear view mirror. It has a LCD display sensor that will automatically adjust the LCD's brightness to the ambient light. On bright days, the screen will be brighter and at night, the screen will be dimmer. With TWO video inputs, you are able to display 2 different types of images. The LCD includes ADJUSTABLE backup lines. Perfectly set your backup lines to match your vehicles body style. This model also includes an Auto Dimming mirror. When there is high glare from behind due to High Beams or Bright lights, the mirror auto dim to reduce glare. This model also includes a built in Compass and Outside Temperature sensor displayed on the upper right corner. The unit comes with a mount that works with many vehicles: Toyota, Nissan, Honda, Mazda, Mitsubishi, GM etc. A Universal windshield mount is also included allowing this unit to be installed on any vehicle. Our Rear View Mirror has an industry leading, clear and distortion free, 4mm thick glass mirror. At Master Tailgaters, we focus on providing superior quality aftermarket parts for your vehicle. When looking for a rear view mirror, we suggest a full replacement mirror. Some Key aspects to also consider that is often missed is the thickness of the glass mirror. The OEM replacement aftermarket 4.3" LCD Rear View Mirror fully replaces your current rear view mirror. It has a LCD display sensor that will automatically adjust the LCD's brightness to the ambient light. On bright days, the screen will be brighter and at night, the screen will be dimmer. The OEM style gives you a sleek and original look fully complimenting your vehicles interior. The unit requires a 12V power source to power the unit. With TWO video inputs, you are able to display 2 different types of images. Everyone hates getting high beamed. This model also includes an Auto Dimming mirror. When there is high glare from behind due to High Beams or Bright lights, the mirror auto dim to reduce glare. The unit comes with a mount works with many popular vehicles: Toyota, Nissan, Honda, Mazda, Mitsubishi, GM etc. A Universal windshield mount is also included which allows this unit to be installed on any vehicle. Our Rear View Mirror has a industry leading, clear and distortion free, 4mm thick glass mirror. This camera connects to any 12V power source. For example, if you wanted the camera to always be on, you can connect it to a 12v source that is on all the time, or if you only want it when you reverse you can connect it to the reverse tail lights. Comes with video and power extension cable, 24 feet. This is an aftermarket tailgate and camera, not OEM. If you plan to install this in a factory radio you most likely will need another connector (not provided). -Before purchasing check the back of your Monitor/Screen that you have a Yellow RCA input for easy installation. -Installation is still possible without the Yellow RCA, however it is much more difficult and will require a professional to splice in the Video In signal. This is an aftermarket tailgate and camera, not OEM. For the power supply, you can connect it to any 12V power source. For example, if you wanted the camera to always be on, you can connect it to a 12v source that is on all the time, or if you only want it when you reverse you can connect it to the reverse taillights. Includes video and power extension cable, 8 Meters(26 feet). Current Consumption : 120mA Max. BACKED BY A 3 YEAR NO QUESTIONS ASKED WARRANTY!!! If your current tailgate handle does not have a locking mechanism and you would like to plug the key hole, this is a perfect fit to cover the hole. This is an aftermarket tailgate and camera, not OEM. If you plan to install this in a factory radio you most likely will need another connector( not provided). The best way to check your original part number is to call your local dealer and ask the parts department for your original part number and compare that to our part number above. This is an aftermarket tailgate and camera, not OEM. For the power supply, you can connect it to any 12V power source. For example, if you wanted the camera to always be on, you can connect it to a 12v source that is on all the time, or if you only want it when you reverse you can connect it to the reverse taillights. Includes video and power extension cable, 8 Meters. Note: This is for the Tailgate Bezel only. Please use your existing handle with this Tailgate Bezel. This tailgate handle is not recommended to be installed with Factory Navigation/Monitor units. It is possible but requires professional installation. This model also includes a built in Compass and Outside Temperature sensor displayed on the upper right corner. The unit comes with a mount works with many popular vehicles: Toyota, Nissan, Honda, Mazda, Mitsubishi, GM etc. A Universal windshield mount is included which allows this unit to be installed on any vehicle. This is an aftermarket tailgate and camera, not OEM. For the power supply, you can connect it to any 12V power source. For example, if you wanted the camera to always be on, you can connect it to a 12v source that is on all the time, or if you only want it when you reverse you can connect it to the reverse taillights. Includes video and power extension cable, 8 Meters. This is an aftermarket Brake Light Backup Camera, not OEM. For the power supply, you can connect it to any 12V power source. For example, if you wanted the camera to always be on, you can connect it to a 12V source that is on all the time, or if you only want it when you reverse you can connect it to the reverse taillights. Includes video and power extension cable, 10 Meters. Provides a clear view of nearby backup surroundings. The most important feature of this Brake Light Backup Camera is the camera. Master Tailgaters is dedicated to providing the best camera: clarity, dependability and longevity. Each Camera is manufactured to provide a clear image. Not all cameras are made the same and we know that which is why Master Tailgaters never cuts any corners. In order to ensure a quality product, our cameras are double checked prior to shipping. Our cameras are designed to work in low light settings. We know that backing up at night deserves a clear and safe picture of your surroundings. Our Brake Light Backup Cameras come with a 4 pin connector, 10M cable, 1M power line, 3 M adhesive pad, adapter line, adapter, and an instruction manual. Everything you'll need for installation! Make sure to compare photos to your own brake light, if it looks different then it will NOT fit. Prior to installing and running all wiring, double check to make sure everything is in proper working order. This is an aftermarket emblem and camera, not OEM. For the power supply, you can connect it to any 12V power source. For example, if you wanted the camera to always be on, you can connect it to a 12v source that is on all the time, or if you only want it when you reverse you can connect it to the reverse taillights. Includes video and power extension cable, 8 Meters. Includes genuine Ford Mounting Screws and Clips. Comes with video and power extension cable, 20 feet. Note: When installing, it is suggested to put a drop of glue behind the camera against the handle to ensure the camera does not move or turn. The red wire along the RCA cable can be used as an alternate power supply should you want to run the power from the head unit. Our Brake Light Backup Cameras come with a 4 pin connector, 10M cable, 1M power line, adapter line, adapter, and an instruction manual. Master Tailgaters presents the Fuse RAD-V1. 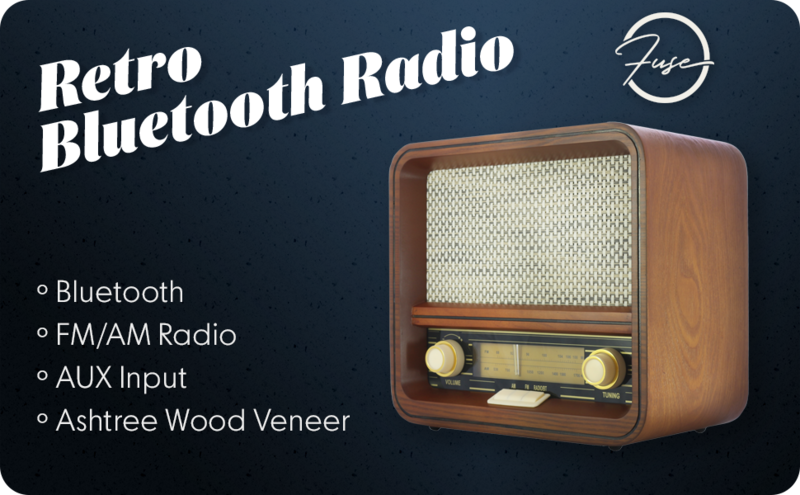 Enjoy high-quality sound with retro style. Bring back the nostalgia without giving up modern conveniences like Bluetooth or USB connectivity. This is an aftermarket Spare Tire Mount Backup Camera, not OEM. For the power supply, you can connect it to any 12V power source. For example, if you wanted the camera to always be on, you can connect it to a 12V source that is on all the time, or if you only want it when you reverse you can connect it to the reverse taillights. Includes video and power extension cable, 6 Meters. The most important feature of this Spare Tire Mount Backup Camera is the camera. Our Spare Tire Mount Backup Camera comes with a 1M power line, 6M video and power extension cable, spare tire mount and backup camera. KaliGlass Tempered GLASS Screen Protectors for Garmin 7612 and 7612xsv. KaliGlass Premium GLASS Protectors are the latest in state-of-the-art screen protection technology. Highly durable and scratch resistant/chip resistant, this strong 9H (hardness level) protector will guarantee your MultiFunction Display the best protection against drops, bumps, scratches and normal wear and tear. Get all the protection without any bulk - KaliGlass Glass protectors are a mere .33mm thin making them ultra-light weight to allow for a 'delicate touch' style screen protector that promises not to interfere with the sensitivity of your touchscreen. To top it all off the KaliGlass GLASS protectors are designed to be 99.99% transparent to promote an optimal, natural, crystal clear viewing experience. Backed by our Easy To Install Guarantee - simply align the protector with your device and a simple swipe of your finger adheres the protector to your screen. KaliGlass Tempered GLASS Screen Protectors for Lowrance HDS 12 Gen 3. The OEM replacement Ultra Bright 7.2" LCD Frameless Rear View Mirror with 4 video inputs and 7 video display modes. It has a LCD display sensor that will automatically adjust the LCD's brightness to the ambient light. With it's unique frameless design the mirror functions as a large LCD screen when needed. Trigger wires allow you to hook this mirror to the reverse light, right turn signal light, left turn signal light, or whatever camera you have setup. The two included cameras can be mounted on the side of the vehicle. When wired to the turn signal lights they will turn on when the turn signal is activated. Customize your camera view with the 7 display modes. The unit comes with a mount that works with many vehicles: Toyota, Nissan, Honda, Mazda, Mitsubishi, GM etc. A Universal windshield mount is also included allowing this unit to be easily installed on any vehicle. Constructed of sturdy metal, this license plate frame backup camera is the perfect way to upgrade your vehicle easily! This small license plate frame camera easily fits on top of your license plate and screws in with your existing screws. With a 170° wide angle lens with a high resolution everything behind your car will be visible. The camera assembly tilts up and down allowing it to adjust to your car's specific design. The camera can be used as a front facing camera. To reverse the image just cut the green loop wire. If you don't need the parking lines the the camera's parking grid lines can be turned off by cutting the white loop wire. Works perfectly with our line of premium rear view mirrors with LCD screens. At Master Tailgaters, we focus on providing superior quality aftermarket parts for your vehicle. The OEM replacement aftermarket Ultra Bright 4.3" LCD Rear View Mirror fully replaces your current rear view mirror. It has a LCD display sensor that will automatically adjust the LCD's brightness to the ambient light. On bright days, the screen will be brighter and at night, the screen will be dimmer. The OEM style gives you a sleek and original look fully complimenting your vehicles interior. TWith TWO video inputs, you are able to display 2 different types of images. The LCD includes ADJUSTABLE backup lines. Perfectly set your backup lines to match your vehicles body style. Everyone hates getting high beamed. This model also includes a Manual Dimming mirror. When there is high glare from behind due to High Beams or Bright lights, the user can flip the mirror switch to reduce glare. The OEM replacement Ultra Bright 4.3" LCD Rear View Mirror with OnStar Buttons fully replaces your current rear view mirror and hooks into the existing wire for your OnStar services. It has a LCD display sensor that will automatically adjust the LCD's brightness to the ambient light. The unit comes with a mount that works with your Buick, Chevrolet, GMC, and Cadillac vehicle. A Universal windshield mount is also included allowing this unit to be easily installed on any vehicle. **NOTE** The OnStar services will only work if you have an existing OnStar installation in your car and are paying for the OnStar service. The buttons will not work otherwise! Just like the luxury cars, the parking lines on this mirror will automatically help guide you into your parking space. Adjust your backup lines to match your vehicles body style and make life safer when backing up. The most important feature of this Rear View Mirror is the LCD. The OEM replacement aftermarket Ultra Bright 4.3" LCD Rear View Mirror fully replaces your current rear view mirror. The LCD on this unit is twice as bright as our other models. It has a LCD display sensor that will automatically adjust the LCD's brightness to the ambient light. On bright days, the screen will be brighter and at night, the screen will be dimmer. When the vehicle is put into reverse, the screen will automatically display the back up camera. Master Tailgaters is dedicated to providing the best quality LCD. Our panels have the best resolution, Contrast Ratio and dependability on the market. Each LCD is manufactured to provide a clear, easy to view image. Not all LCDs are made the same and we know that which is why Master Tailgaters never cuts any corners. Our LCD's all come with an Auto Adjustingfeature. The LCD will adjust it's brightness to the Ambient light. During low light such as night time, the LCD will be less bright so not to blind the driver. For ease of control, a remote is included with this Rear View Mirror. This Rear View Mirror is equipped with Bluetooth. Pairing your phone with this mirror allows you to accept incoming calls, end calls, decline calls and make calls with voice dialing* (* phone needs to have this feature). Included is a high quality wired microphone and speaker built into the mirror. The most important feature of this Rear View Mirror is the LCD. Master Tailgaters is dedicated to providing the best quality LCD. Our panels have the best resolution, Contrast Ratio and dependability on the market. Each LCD is manufactured to provide a clear, easy to view image. Not all LCDs are made the same and we know that which is why Master Tailgaters never cuts any corners. When the vehicle is put into reverse, the screen will automatically display the back up camera. The unit comes with a mount that works with many popular vehicles: Toyota, Nissan, Honda, Mazda, Mitsubishi, GM etc. A Universal windshield mount is also included which allows this unit to be installed on any vehicle. Each LCD is manufactured to provide a clear, easy to view image. Not all LCD's are made the same and we know that which is why Master Tailgaters never cuts any corners. Our LCD's all come with an Auto Adjusting feature. The LCD will adjust it's brightness to the Ambient light. During low light such as night time, the LCD will be less bright so not to blind the driver. This small license plate frame camera easily fits behind your license plate and screws in with your existing screws. It can be used at the front or back of your car. With a 170° wide angle lens and a high resolution, everything behind your car will be visible. This versatile camera can display backup grids or can be used as a front or back facing camera with just a simple snip of a wire. Not only will you be able to safely avoid any obstacles while driving, it will also make parking a breeze! If you would like to have parking lines then the camera's parking grid lines can be turned on by cutting the white loop wire. To reverse the image and use it as a backup camera, just cut the green loop wire. Backing up has never been easier! Our OEM replacement Ultra Bright 4.3" LCD Rear View Mirror fully replaces your current rear view mirror and includes a special display for the parking sensors. Everything is included to install our high-quality parking sensor kit. The included drill bit will drill the correct sized holes for the 4 parking sensors. Master Tailgaters Tailgate Handle with Backup camera is the perfect solution to your aftermarket needs. Each Tailgate Handle is manufacutured to provide an OEM fit and finish. The camera plugs directly into your RCA input. Note: not designed for OEM factory monitors/screens. ​Camera angle is pointed at a slight downward angle to provide full view of your trailer ball hitch. Parking Grid: The backup camera also displays a parking grid for your safety. Should you not want it to display the parking grid, it can be disabled. -This tailgate handle is not recommended to be installed with Factory Navigation/Monitor units. It is possible but requires professional installation. At Master Tailgaters, we believe in QUALITY. Our focus is to provide you with a long lasting quality product. We believe in our products so much that we provide the longest warranty on the market compared to any of our competitors. Other low quality cameras can become defective soon after. Replacing and rerunning wiring is what we want you to avoid! The backup camera also displays a parking grid for your safety. Should you not want it to display the parking grid, it can be disabled. The camera's parking grid lines can be turned off by cutting the white loop wire. PAL mode can be enabled by cutting the blue loop wire. Buy from a Trusted Seller since 1998! This is an aftermarket tailgate and camera, not OEM. For the power supply, you can connect it to any 12V power source. For example, if you wanted the camera to always be on, you can connect it to a 12V source that is on all the time, or if you only want it when you reverse you can connect it to the reverse taillights. Includes video and power extension cable, 8 Meters (26 feet). Parking Grid: The backup camera also displays a parking grid for your safety. Should you not want it to display the parking grid, it can be disabled. The camera's parking grid lines can be turned off by cutting the white loop wire. PAL mode can be enabled by cutting the blue loop wire.